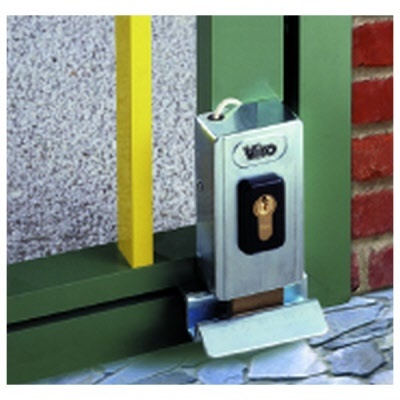 The V06 electric lock is suitable for inside or outside manual or automatic doors and pedestrian or drive-through gates and is interchangeable with the V96 electric locks. 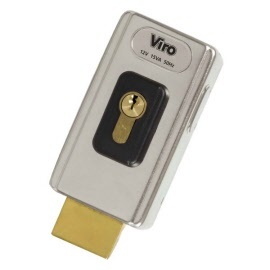 It is supplied standard with the service function and, by simply removing an internal part, can get the security function. Its small size and the floor striker provided make it ideal for vertical installation on narrow frames; it can however also be mounted horizontally, using an optional striker. service (standard): the lock opens with the electric impulse and only resets once the door/gate has been opened and then closed. It is therefore suitable for use with doorclosers and/or all types of automation systems. Voltage: standard 12V AC Case: one-piece galvanized steel. Rotating dead-bolt: solid brass, with nylon insert which makes the locking more silent. Cylinder: set up for double or half profile cylinders (not provided). Supplied with: galvanized steel floor striker (item 9986). nylon ring nut and plug, passivated steel support for profile cylinder and fixing screws.